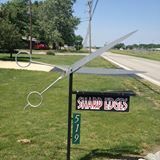 We are a Sharpening Service in the Central Illinois area. We specialize in the art of sharpening and reconditioning high quality cosmetology shears and thinners. We also service all Barber and Pet Grooming tools. We can also sharpen your knives, household shears, lawn mower blades and saw chains. This is also the home of the Hamaguri Advanced Convex Shear Sharpener. The top qulity sharpening machine for your high end beauty and grooming shears.